BYU’s Dead Sea Scrolls expert regales a Wyoming Alumni Chapter audience with secrets of the scrolls. One of the greatest ancient manuscript discoveries of the 20th century was almost turned into sandals. In 1947 two teenage shepherds in Qumran, near the Dead Sea, stumbled across ancient scrolls—many of which were made of animal skins—and sold them to a shoemaker for today’s equivalent of $20. In the years that followed, more scrolls were discovered and the collection of what came to be known as the Dead Sea Scrolls grew to more than 900 religious texts. About 225 of these scrolls are books from the Old Testament, and their discovery has revolutionized the way scholars study the Bible. Prior to the discovery, experts had to rely on medieval translations of the Bible, which were flawed and yielded little insight on ancient Hebrew culture and practices. Now, more than 50 years later, scholars on the Dead Sea Scrolls are still making new discoveries, from linguistics to religion. •	The scrolls feature the world’s oldest extant Hebrew Bible, which is more than 1,000 years older than the Masoretic Text (from whence the Old Testament was translated in the King James Version and other modern bibles). •	The Copper Scroll details the whereabouts of massive hidden treasure, including gold, silver, spices, and precious objects. •	Ancient Hebrew texts and other writings show that many of the names used by the people of the Book of Mormon—such as Alma, Hagoth, and Sariah—were also used in the ancient Middle East. 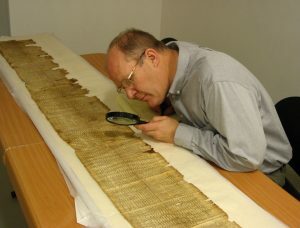 •	The scrolls include the world’s oldest complete text of Isaiah (a scroll 23 and a half feet long). Parry also gave a short lesson in Hebrew writing and bore testimony of the significant references to Christ in the Old Testament. Raised amid violence and fear, a Palestinian woman discovers that her most threatening enemy is hatred. For the first time at BYU, more than half of female graduates are RMs. To connect with Millennials about faith, we need to understand the questions they are asking. This Hebrew primer will unlock the meaning in some common Biblical terms and enrich your scripture study. A life-size replica of Moses’s tabernacle built on BYU campus gave students a look at ancient Israelite worship. What’s this on campus? Check out the Israelite tabernacle and get insights from expert religion professors.